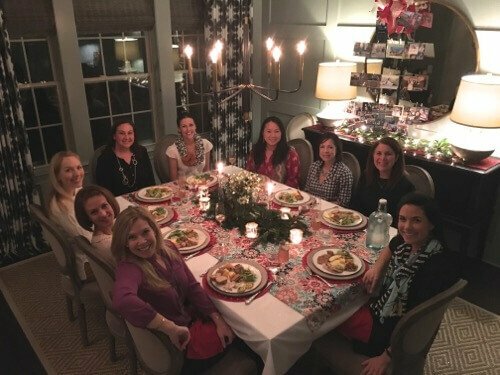 Every December I get together with my closest group of mom-friends (which originally started as a playgroup over a decade ago!) for a holiday cookie exchange party. We have all been through so much together over the years including that time, back when I was fresh off our real food pledge, I convinced everyone we should exchange homemade “gifty” items instead of cookies. Let’s just say that didn’t last for more than a year for obvious reasons – ha! About to enjoy our little potluck feast before exchanging cookies (and gifts)! 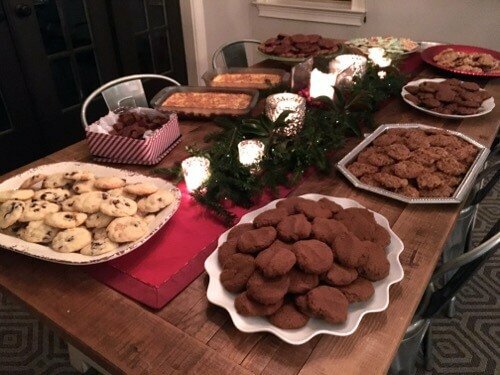 What did eventually change, though, is that instead of bagging up a half dozen cookies for each recipient, we now bring everything on platters so each person can take as many as they want. I usually end up taking more like two of each instead of the standard six or so (times 10 batches of cookies!). It feels like the right balance for us this time of year without having to miss out on any of the fun! Plus you get to sample the cookies when they are out on platters like this – yummy, yummy. I try to make a different cookie recipe each year so I can share it on the blog. 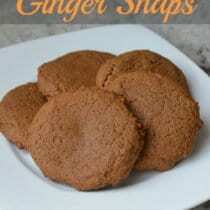 And this year I made Whole-Wheat Ginger Snaps! I’d never made them before and went through a couple of batches before I was satisfied with the results. While I was getting everything out to make the final batch, only two hours before everyone arrived (due to a last minute change, I ended up hosting with only a day’s notice! ), I realized we were almost out of ginger. Umm, ooops. I obviously could not make ginger snaps without ginger, so I begged my husband to puhlease run to the store real quick for some ginger while I frantically worked on my appetizer (quinoa cakes) and cleaned up all the mess. A few minutes later, he came back from the store and handed me two bottles of cinnamon. Yes, CINNAMON! I said please tell me this is a joke and the ginger is still hiding in your car somewhere. So, without further ado … here is the recipe! In a separate bowl, with an electric whisk/beater combine the wet ingredients. Slowly add the flour mixture to the wet ingredients while mixing until well combined. Stop and scrape the sides of the mixing bowl if necessary. Drop the cookie dough by the spoonful (I used a small scoop to make this job easy) onto a large ungreased baking sheet. Flatten each cookie with the back of a spoon or with your fingers. Bake until done all the way through, 10 - 13 minutes. Transfer to a wire rack to cool and serve. Can it be regular WW flour instead of the pastry? Yes! I am really loving pastry flour in baked goods these days (reminds me more of white flour), but regular ww flour will absolutely work. Are they chewy or hard? They are chewy but if you like them crisp you can increase the baking time. And chewiness. Try adding finely cut crystalized ginger for more chew and zing. Start with a TB or so. I like about a 1/4 c. For 1 1/2 c. Flour. Funny story, Lisa! Glad you had a good time. What about using white whole wheat flour? Similiar result? Love your story and glad it worked out in the end! 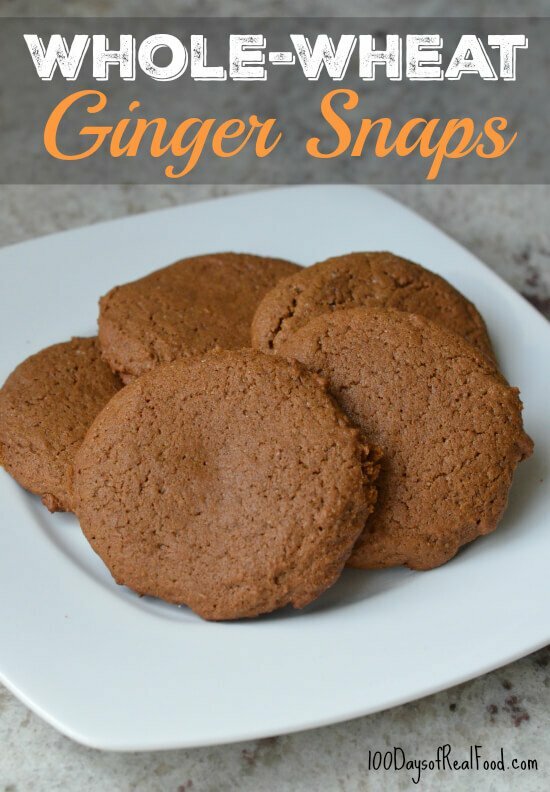 Gingersnaps are my all-time favorite holiday cookie! Thanks for the experimenting so I don’t have to :) And I *may* have grabbed a container of paprika at the store instead of the cinnamon once. I haven’t lived that down yet.